It’s taken me a while to start eating ‘normally’ again after Christmas. When I say ‘normally’, I mean actually eating something. I’ve been skipping breakfast (okay, so no change there then – I can’t stand the thought of eating first thing; it seems the height of gluttony to me to stuff your face the moment you wake up) and lunch and I’ve only been eating dinner because it seemed like something I should be doing and even then my dinners have consisted mostly of cardboard boxed frozen stuff heated up in the oven. Unsurprisingly, this diet of nothing has made me sluggish and unfocused and so I went hunting and foraging for vegetables in my local Tesco with which to make some soup and get some vitamins inside me. Usually – as one of the members in my writing group pointed out last night – my soups are a vibrant green, so I decided to make a non-green soup for a change. Despite this, when I posted a photo of my cauliflower soup on Facebook for a game of Guess the Soup (it doesn’t take a genius to work out the rules to that game, eh? ), until I pointed out it wasn’t green, people were guessing green soups such as asparagus, pea and courgette, so I guess the cumin made it a bit murky. This vegan cauliflower, cumin and chilli soup is delicious, but be warned – your house will smell like an Indian restaurant all afternoon, evening and night after you make it. As usual, I blended this soup to silky smooth perfection in my Froothie Optimum G2.1 high speed blender. I know I keep saying it but this blender really has transformed my soup into something special and, as a Froothie Ambassador, I can offer you free post and packing on any Froothie appliance – just enter ‘3437 free ambassador delivery’ in the comment box when you order and the p&p will be credited back to your card, saving you £10 (well, £9.99 I think, to be specific). Heat the oil in a large pan and add the onion, garlic and ground cumin. Fry, stirring occasionally, for about 5 minutes until soft. Add the stock, cauliflower, dried chilli (or chilli powder) and season with salt and pepper. Simmer for about 15 minutes, until the cauliflower is cooked. 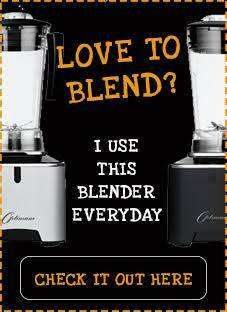 Blend on full power for 1 minute (or if using a non-high-speed blender, blend until smooth). 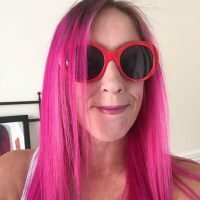 Disclosure: I am an Ambassador for Froothie and any links to their products in this post are affiliate links which, if purchased through, won’t cost you any more but will earn me a small commission. I only endorse products I am happy with and I have not been paid for this post. For more information about the Optimum G2.1 blender mentioned in this post, you can read my review here. Love the bowl and the soup sounds pretty mean too. You can’t beat soup at this time of year. Looking forward to seeing your air fried to fish. Thanks! I am stupidly excited about making the tofish tonight – I hope it turns out okay. 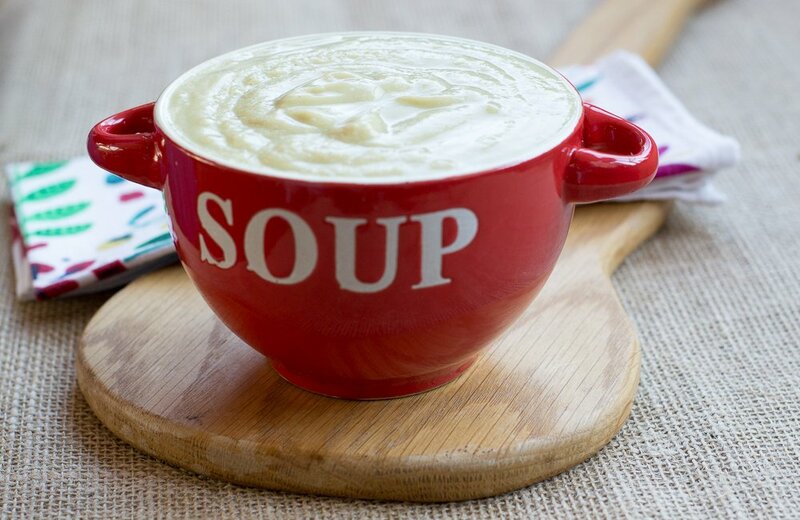 What a great combination of flavours, the soup looks so smooth and creamy with your Froothie blender. I love cauliflower soup and that’s a great combo you have there. Looking forward to seeing the air fried fish! Soup is just perfect this time of year. I love the combo of cauliflower and cumin – yum! That looks like such a thick and creamy soup. I love cauliflower soup, but sometimes it makes the house smell a bit cabbagy, so I would rather have it smell of an Indian! That’s a very good point – a cabbagey-smelling house isn’t great! Making the house smell like an Indian sounds ideal to me! Pinning for future use. This sounds so delicious and comforting. Love that you’ve added a spicy kick too! I love soup and make a lot of it. Cumin is one of my go to spices for flavouring soup too. Although I usually team the cauliflower with broccoli or make it cheesey (veggie & vegan). This sounds wonderful! Love the spices you have used with the cauliflower. I may just make this tomorrow as I have a cauli lurking in the fridge. I wish I did wake up starving but I just can’t face food first thing!